The last thing any homeowner wants is to find puddles in the basement, which is why waterproofing near San Antonio is so important. Interior and exterior basement waterproofing can help you avoid the dangerous of water damage, mold growth, and poor indoor air quality in your home. To determine what type of waterproofing is best for the situation, however, it is first necessary to identify the source of the problem. Continue on if you would like to learn about the steps of basement waterproofing. A fully prepared homeowner will have a proper drainage system in place in order to prevent water from pooling around the foundation of the home. Unfortunately there are a few problems that may arise regarding these drainage systems if they are not maintained. Clogged gutters can lead water to overflow into the backfill, or the gutter may not extend past the backfill in the first place. If water is allowed to run or pool alongside your house rather than draining away from your foundation, it may seep into your home. It is particularly important to keep up on your drainage maintenance during the fall and winter months when leaves and snow are more likely to interfere with your drainage processes. In addition to drainage problems, you may experience water in your basement due to backfill saturation. 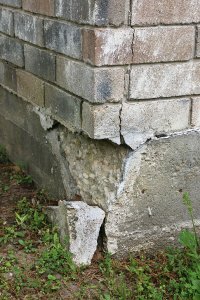 This occurs because the soil that lies between your foundation and the natural earth is looser and more prone to absorbing water. As more and more water makes its way into this loose soil, more pressure is put on your foundation and eventually water seeps through the concrete. Your waterproofing company can address this problem by installing a drainage system inside your basement. In this case water will enter the basement, but it will be removed before it can cause damage.